Preface. List of figures. List of tables. Basic notation. Elements of the Plasticity Theory. Stress State. Flow kinematics. Rigid-plastic solid and yield criteria. Flow rule. Complete solution and problems formulation. Stress and velocity discontinuities. Generalized solutions. Plastic constant estimation. Extremum Theorems. Virtual energy rate equation. Extremum theorem for real velocity field. Extremum theorem for real stress field. Upper and lower bound estimation methods. Plane Strain Flow Theory. Basic equations. Characteristics. Geometrical properties of the characteristics. Velocity and stress discontinuities. Basic boundary value problems. Analytical method. Velocity hodograph and plastic dissipation rate. Statically and kinematically determinate problems. Statical stress field continuation into the rigid region. Axisymmetric Flow Theory. Basic equations. Characteristics for tresca yield criterion. Stress and velocity discontinuities. Plastic dissipation rate control. Numerical and Graphical Methods. Graphical generation of plane strain characteristic net. Numerical solution of the axisymmetric plastic flow equations. Computer procedures for the basic boundary value problems. 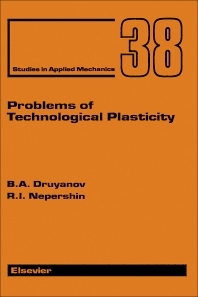 Numerical control of plastic dissipation rate. Sheet Rolling. Sheet rolling basic concepts. Thick-sheet rolling. Mean-thickness sheet rolling. Thick-sheet rolling with back-tension. Steady-State Forming Processes. Extrusion, drawing and reducing through inclined dies with small workpiece reduction. Extrusion and piercing with large workpiece reduction. Optimal die profiles for extrusion and drawing. Steady-state electrical upsetting. Workpiece Compression By Flat Dies and Strip Cutting. Plane strain thin workpiece compression between rough parallel dies. Thin workpiece compression between flat elastic dies. Thick workpiece compression by flat rough dies. Strip cutting. Punch Indentation Problems. Prandtl's flat smooth punch indentation problem. Smooth spherical punch indentation. Plane strain thick strip indentation by convex punch. Smooth wedge indentation. Smooth cone indentation. Forging. High workpiece forging by two flat dies. Cylindrical workpiece forging by three inclined flat dies. Final stage of die forging. Cold forging of the balls. Thermo-mechanical fatigue life prediction of hot forging dies. Rivet joint forming. Plane Strain Problems with Continuous Kinematic Boundary Conditions. Basic equations. Numerical solution of curl and stream function equations. Extrusion and piercing by rectangular smooth dies. Flat smooth punch indentation and linear crack tension. Compacting of Compressible Plastic Solids. Yield criterion and flow rule for compressible materials. Yield stresses. Initial and boundary value problems. On the friction laws of plastic solids. Extremum theorem for strain history dependent plastic solid. Compacting in closed dies. Appendix. Subject index.